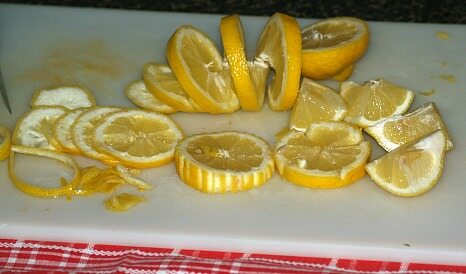 It is nice to learn how to make garnishes if you plan to entertain. Garnishes can be very simple or more elaborate. For me it depends on the type of gathering that I am hosting. You might notice, when eating out that restaurants will add some little garnish to your plate. This garnish is meant to add a little color or additional taste. In many places where I have worked, we would add maybe a peach or pear half with a cherry on top. This added contrasting color to the plate plus a little sweet fruit taste. Perhaps you want to know how to make garnishes for dishes like soups or potato or other creamed salads. For these something as simple as sprinkling paprika or chopped parsley over the top turns the dish into elegant. Actually, adding spices and herbs to your dishes should be a practice used every day for your family. Learn how to make garnishes which are easy. There are still more ways to add eye appeal to your dishes without much thought and without using much of your time. Thinly sliced oranges cut in half, lemons thinly sliced or in wedges, sliced radishes or thinly sliced onion all contribute to most dishes. You might like to incorporate a “garnish” into your meal when cooking. For instance a small baked stuffed red apple goes well with baked pork and also adds contrasting color for presentation. These could even be baked with the pork. Colorful sauces are often used on dinner plates to make beautiful presentations. For instance, cover the plate with a brown sauce and place a slice of white turkey breast in the center. Drop a few drops of white sauce over the brown sauce. Run a toothpick through the white dots and draw a design. Learn how to make garnishes like adding a tiny piece of parsley on top of the turkey and you have a beautiful presentation. Many people love different flavor relishes with certain foods; for instance turkey and cranberry relish. Again, this adds pretty contrasting color and taste to the turkey meat. A small cup like this relish can serve as a garnish if there is room on the plate. Many people at Holiday time would be completely disappointed if they were not served this cranberry relish with their turkey dinner. Speaking of holidays, I like to do extra special garnishes for these times as well as for all parties. I like for every dish to have special “eye appeal” so I try to learn how to make garnishes that are extra special for every food served. My favorite special garnish is a tomato rose. It is easy to make and turns everything into elegance. Another favorite is a bird or duck carved from an apple. Many elegant garnishes can be made with fruits and vegetables. Carve flowers from red, yellow and orange peppers or other vegetables. These are all pretty easy once you get the “hang” of it. All are always appreciated at gatherings. Some fruits and vegetables are great because they can be carved to make unique serving bowls. Simply use your imagination. Below are some of my favorite garnishes to use on all types of food. TOMATOES: Cut top off cherry tomatoes and squeeze out seeds; pipe herbed butter into center. FOR MY TOMATO ROSE: Start with slicing partially across the top of a tomato, continue moving the knife around and around the tomato until you reach the bottom of the tomato making one long strip of peel. Start rolling the strip up beginning at the end. Place the rose down with the first slice on the bottom. 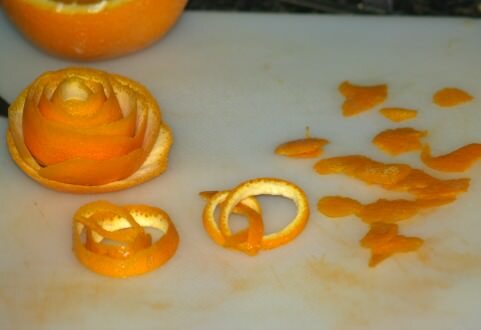 ORANGE: Grated orange peel; twisted orange slices; orange slices; orange rose (just like the tomato rose). CUCUMBERS: Peel, half and thinly slice; arrange overlapping around platter; thinly slice and cut edges with scalloped edge cutter; sprinkle tops of slices with chopped parsley or dill. CARROTS: Carrot strips. Thinly slice carrots and use mini aspic cutters to make flowers or unusual designs; finely grate to top salads and other fresh foods or arrange on plate with chopped parsley; cut cooked carrots with a melon ball shaper and season with butter, salt and pepper. TURNIPS: Use a spiral cutter to cut small turnips into spirals to make garland; turnip roses. ONIONS: Sliced red or white onions; slice a red onion down from to almost to bottom and insert herbs; use onion rings and sprigs of herbs. BUTTER: Use molds or pipe softened butter or herbed butter and refrigerate to set; shape butter into balls and roll in paprika or finely chopped parsley. LEEKS: Slice thin and pull apart into rings. MUSHROOMS: Slice or chop to add to plates. To flute mushrooms hold mushroom in left hand if right handed; place tip of sharp knife at top center of mushroom. Draw knife down toward edge of mushroom while gently turning counter clockwise; point of knife will make a curved shallow groove. Continue making grooves around mushroom and remove slivers. Immerse into water with lemon juice to keep from discoloring. 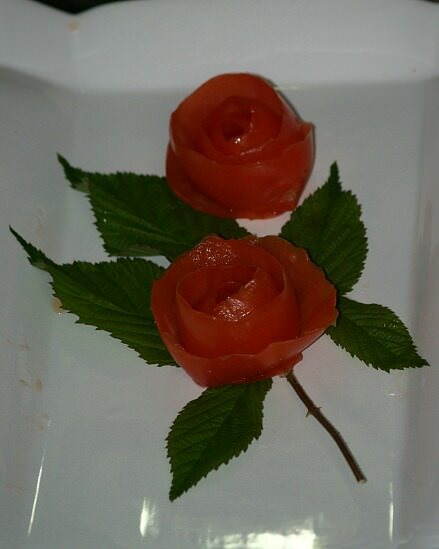 To make radish roses use a small sharp knife; cut small petals on the outside of radish. Cut a second row of petals inside the first set of petals. Place radish in ice water to open. PEPPERS: Cut peppers in strips. Cut into diamond shapes and arrange to look like flowers. CELERY: Cut in strips; cut in diamond shapes and arrange to look like flowers. POTATOES: Pipe whipped potatoes or whipped sweet potatoes around the edge of a platter of meat. EGGS: Slice and fan out; slice, grate or chop. OLIVES: slice, chop or whole olives. GERKINS: Slice and fan out, slice or chop. STRAWBERRIES: Sliced and fan out, sliced and chopped. MARASCINO CHERRIES: Whole, sliced and chopped. BERRIES: Raspberries, blackberries and other small berries with mint and other green leaves. (I use a lot of wild raspberries leaves.). CHOCOLATE: Grated, chopped, curls, leaves and roses.